Telecoms and operators must change – more out of survival necessity. Voice revenues are shrinking and “Over the top” challenges are eating into P2P revenues. Then there are technology disruptions such as Soft SIM. A study from Ovum suggests that by 2016, operators will have lost $54 billion in SMS revenues due to the growing popularity of online messaging. 79% of operators believe that OTT clients on smartphones are a threat to traditional SMS and voice based services. In 2011, 67.6% of operators identified messaging as the most challenged service by OTT, but that figure has increased to 73.7% in 2012. 52.1% of the operators claim OTT has impacted on 1-20% of traffic in 2012, up from 29.7% in 2011. The denial charecterestic of operators is slowly on the wane – as operators grapple to hold on to shifting sands. This is reminiscent of the way movie and music industry has been disrupted and laid asunder by the Torrents of the world. The key realization that needs to come through for operators is that they need to realize that they are not in the pipe business – rather they own a significant part of the media business. Realization along these lines, could be critical in opening up thought processes around creation of content and media platforms, leased services on the cloud, location centric services, context awareness, semantics awareness… operators need to pull up the game from the pipe to compelling internet based services. A part of this new services paradigm would depend on creating platforms that host eco-systems and users co-creating and consuming real time. A lot of the operator mentality is bound around the pipe syndrome with customer ownership. However, an open system/platform is key to creating value in terms of experience, discovery and revenues/profits for the ecosystem. Operators need to graduate from the walled thinking to a shared approach. 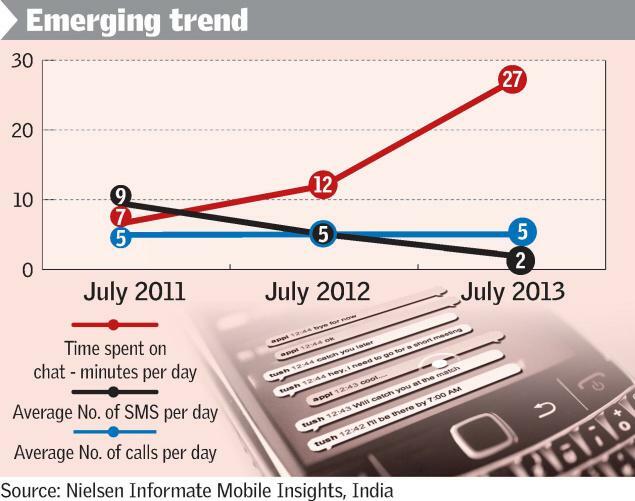 SMS is going the way of the Dodo- as per Nielsen’s latest Mobile Insights. In last 2 years in India- SMSs have lost 71.5% of the ground declining from 9 per day per user (2011) to 2 per day per user (July 2013). This isn’t a one of trend – SMSs are declining in usage in countries like China as well, where SMS usage has fallen by 15% in a year. Mobile chat applications are taking over registering a 285% increase in usage minutes over the last 2 years. OTT is beginning to take its toll on Operator revenues. The spot of bother is also that voice calling seems to have hit the plateau as well. 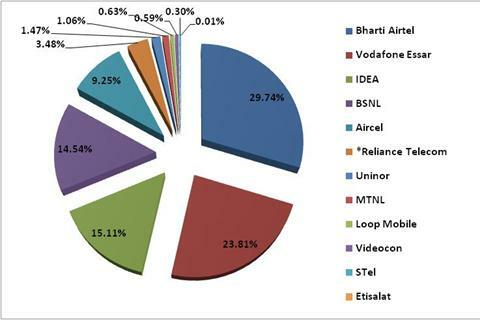 Thus telcos in India are really being cornered on data as the only revenue driver. A case in point is Airtel which in its June 2013 quarter results reported 90% increase in data usage and a corresponding 3% drop in SMS revenues (from 11% to 8%). Idea reported a 92.2% increase in mobile data traffic in last year. The shift from SMS to Social Messaging through smartphone apps is only but a substitution effect.While the rates for SMS vary from Re 1 for local messages to Rs 1.50 for national and Rs 5 for international, data services usage can be unlimited after paying a fixed fee. Moreover, most social messaging services are either free or based on discounted plans. The operator VAS business would thus be facing the squeeze. While data usage is on the rise, revenue is shifting from high value VAS to data only. Operators are under the pressure to look for more revenue oasis than ever. Wireless Intelligence released a report recently on the Top 20 Mobile Operators in the world based on revenues. The list is led by China Mobile followed by Vodafone and Verizon. 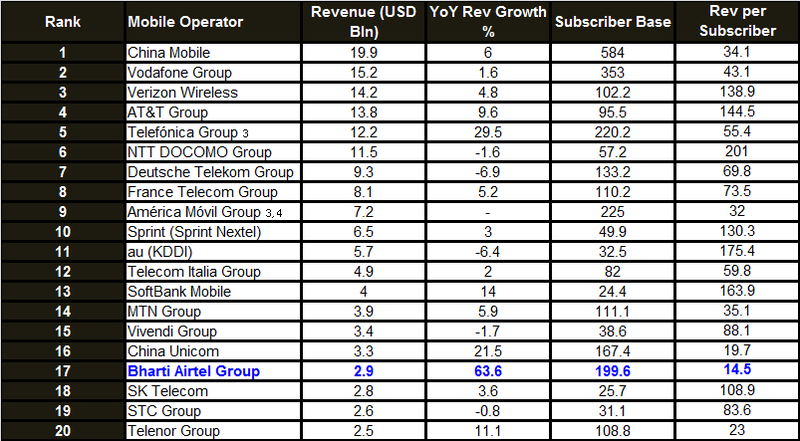 Bharti Airtel scores 5th in terms of subscribers having just shy of 200 million subscribers. However, Airtel is the worst performer in terms of revenue generated per user. Airtel earns USD 14.5 per subscriber in an year, equivalent to about Rs. 650 in an year.China Mobile earns over Rs. 1530 on its 584 Million Subscriber base. NTT DOCOMO which is primarily based in Japan, earns over 9000 rupees per subscriber and ranks 6th largest in terms of revenue on its relatively miniscule 57 million subscriber base. That is about 14 times more than Bharti Airtel ! 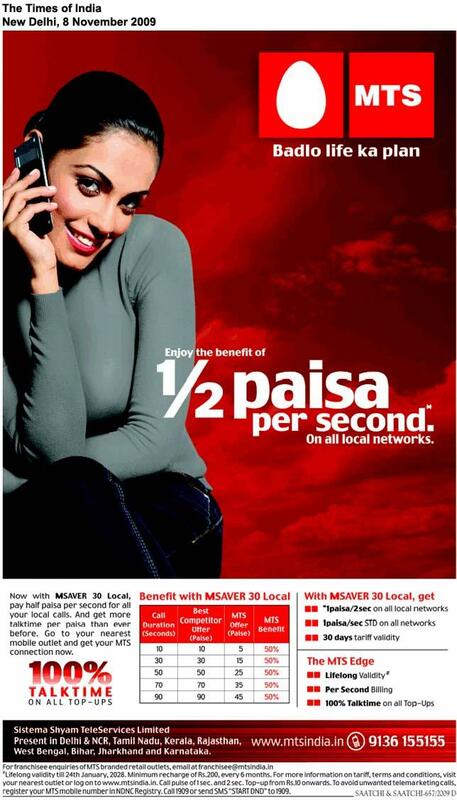 7 out of top 20 mobile operators earn over Rs. 4500 (USD 100) per subscriber. The average per subscriber earning amongst top 20 mobile providers is Rs. 3813! A day after Illja Laurs, CEO GetJar issued a statement on how operators are being marginalized by their customers when it comes to mobile apps and how there’s little hope of getting them back, another post by GetJar CMO Patrick Mork deserves mention. Patrick Mork has outlined four guiding principles he thinks app stores should use to help developers make money. Except that if you read between the lines it states how operators gag the “development” and “discovery”. The blog by Patrick measures up the gag tactics at Amazon’s Android store for instance. It also underlines how developer friendly policies at GetJar have helped them catapult themselves into No.2 Apps store by downloads (when in fact they are are an “independent” and “others” app store). 1. Let developers set their own price. Developers are big boys and girls. They know how important price is and they know it can only be used so often to be effective. Unlike app stores, they also only generally have a few apps to use this on so when they use it they need to make it count. It’s fine to suggest pricing to developers but ultimately only they know what they need to make a living and they could / should study consumer behavior enough to understand what the most effective price point is. 3. Don’t tie down developers’ ability to promote across store fronts: In an ideal world, Android distribution is supposed to be open (thank you AT&T for helping us get closer to that reality). App stores shouldn’t hamper developers’ ability to leverage promotions or placement in other stores through rigid pricing policies. App stores should realize that developers will look to different app stores for different promotional opportunities. If I can’t get app store A to feature their game but App Store B will feature it if they discount it then why not be able to this? Android is supposed to benefit developers through open distribution, if stores abuse pricing to reduce this distribution it defeats the whole purpose behind open distribution and ultimately makes it harder to pay the rent. 4. Show developers some respect for the product they create and communicate that: If app stores set pricing it should be in conjunction with developers. At the very least, App stores should provide multiple price points to choose from as well as case studies, best practices and advice to developers on when / how to manage the price life cycle to optimize revenues. Back in the much criticized carrier days as a developer I would often work with carriers to agree on pricing and we would jointly agree on how to manage this. App stores should and do have an opinion on pricing of apps given their wider view of the market and they should communicate this. However, to build goodwill they should work with developers and not independently of them. The app space is an amorphous, rapidly shifting landscape. The technology, distribution and pricing are ever changing and make it difficult for developers to build great products and successful monetize them. What the app stores need to do is give developers flexibility, tools, support and advice on how to this and not dictate to them. As app stores we need to keep in mind that ultimately content is what consumers come to us for. It’s a bit tough to meet that demand if you ignore developers or worse, impose restrictive commercial policies on them. We can do better than that. Inevitability finally catches up with the new comers in the Indian Telecom space. It is a no brainer to see that a market with 15 players will not have space for the bottom listers. Thus new entrants are beginning to scale down the roll out plans and shying away from reducing the tariffs further. With 14-15 Telcos jostling for share of the consumer purse, consolidation is now setting into the Indian Telecom markets. In most circles, only about 6 operators continue to sustain market momentum. The Top 6 players account for 90% of the market shares by subscriptions and higher shares by value. The intensity of competition is coming down visibly. Some of the new entrants in the telecoms market have not rolled out networks in many geographies despite being granted spectrum. All new entrants – with the exception of Sistema – are under probe by both the Central Vigilance Commission as well as the Prime Minister’s office for delaying the rollout of their operations. While it has been close to three years since these firms bagged their license, Etisalat DB is yet to launch commercial services, Loop Mobile has started services only in Mumbai while Videocon has launched mobile services in only in five of the 22 circles. Even Uninor and S Tel, the other new entrants, have failed to meet all their rollout obligations. Many new entrants did not bid for 3G and broadband spectrum. All this are tell-tale signs that consolidation has started in the minds of companies. Consolidation has also started in the minds of customers. Even in this crowded market, six operators now account for almost the entire revenue market share, indicating that customers have learnt to recognise bigger, more established, stronger and better brands. The increase in minutes of usage for larger mobile companies is proof that only certain players are present in the minds of consumer. The top six players have an unique advantage as they have a larger and longer brand recall. The top 3 Telcos have registered increases in the minutes of usage in the quarter. Tata DoCoMo, Telenor and MTS set off a savage tariff war last year when they entered the Indian market. This resulted in a fall in profits and revenues of all operators. But the rate of growth posted by these companies slowed substantially in the last quarter. Uninor, STel, Loop, Etisalat DB, Videocon, and Sistema together added less than 12% of 18 million customer additions in June. This is in sharp contrast to last year’s numbers when Uninor added a million users within 30 days of launch. STel managed to clock one million subscribers in 90 days from three small circles. While Videocon added 1.39 million users in May, it could add only a third of that in June. 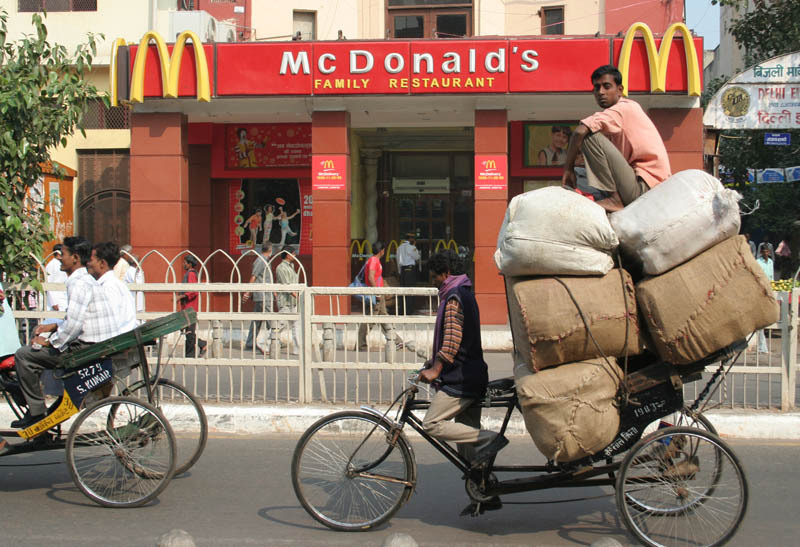 The new entrants together account for less than 3% of India’s 600 million mobile users. With 10 million and more subscriptions happening per month, The Indian Telecom Market is the largest growing Telecom market in the world. However, Telco after Telco have made the mistake of entering the Indian Market without a proper and thought through strategy. The three pronged strategy basis volumes from 10 million subscriptions, ARPU from Data services and high end customers from MNP has not really worked. MNP has not kicked in yet, and moreover, the incumbents today have the scale, information and cumulative resources to dig deep into the consumer wallets. The Challengers in this scenario were required to out-innovate, not out-run the market by larger marketing dollars and cheaper call rates. That unfortunately has not been the forte of the Videocons, Etisalats and Telenors of the world. Reminds me of an old blog post on the merits of MNOs/MVNOs. 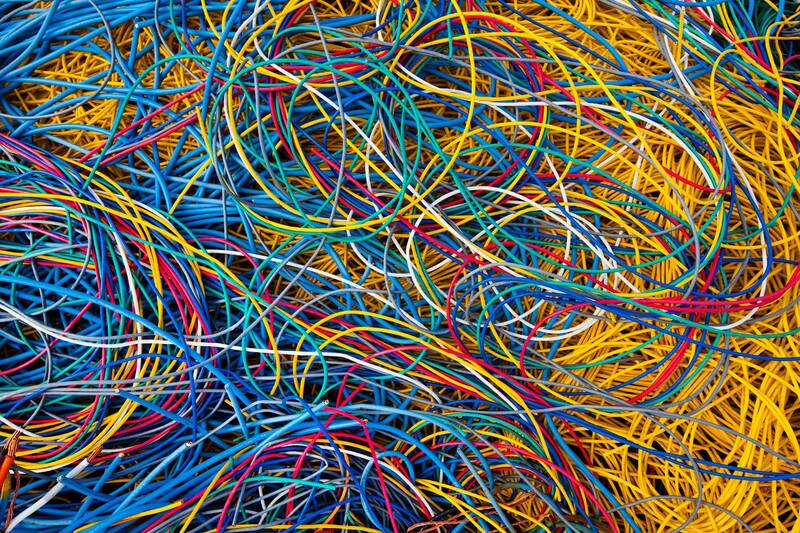 There still is space in that corner, but the new Telcos need to re-look at their complete thought, perspective and the revenue generation dynamics. Emerging markets will drive the growth of global mobile value-added-service (VAS) revenues from $200bn in 2009 to $340bn in 2014. With China, India, Indonesia, South Africa, Nigeria, Egypt, Turkey, Israel, Saudi Arabia, Brazil, Mexico, Argentina, Russia, Poland and the Ukraine expected to account for 36 per cent of such revenues at the end of the forecast period.These numbers were released by Informa Telecoms & Media, which has been monitoring the high growth potential for VAS in emerging markets as high market saturation limits growth prospects in developed countries. In fact, operators and service providers in emerging markets have been more innovative and proactive in developing and deploying mobile VAS than their counterparts in the developed world, especially in the areas of mobile payments, P2P funds transfer and agricultural information services. The reason being that these services are having a big impact on the day-to-day lives of the local population and are contributing to the social and economic development of the population in these markets, Informa said, citing services such as M-Pesa from Safaricom in Kenya, the Rural Information Service from China Mobile, the Please Call Me service from MTN in South Africa, and the CellBazaar service from GrameenPhone in Bangladesh. “Compared to the developed world, there are very different economic, social, demographic and cultural challenges in the emerging markets. In many countries, 3G services are still not available, or are limited to mobile subscribers in larger cities. 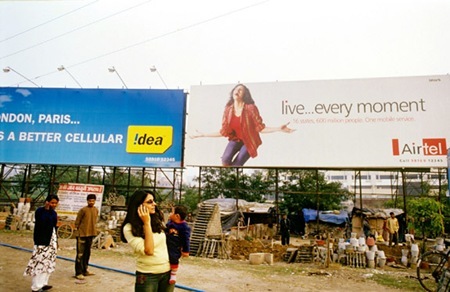 Therefore operators have to depend on 2G services such as SMS, USSD (Unstructured Supplementary Service Data) and IVR (Interactive Voice Response) systems, to be able to drive mass market adoption of their mobile value-added-services, and to successfully reach subscribers in smaller towns and rural areas,” said Shailendra Pandey, senior analyst at Informa. Pandey adds that mobile social networking is beginning to see strong growth in emerging markets but most of the services are instant messaging chat applications. One of the most successful service examples is China Mobile’s IM service called Fetion, which has over 100 million registered users. The addressable market for the Fetion service is large as it can work using IVR, GPRS and SMS access modes. Also, mobile app stores have so far not received the same attention from the operators in emerging markets as they have in the US and Western Europe, although some large operators like China Mobile have already launched – or are considering launching – their own app stores. Earlier this year, China Mobile collaborated with Nokia to launch a joint mobile app store MM-Ovi and it has been reported that over four million mobile apps had been downloaded from this app store by March 2010. This post talks about shifting the focus on innovation for apps and services to customer centric models amidst larger value creation templates with more stakeholders. It also shows the roadmap and indicators for value creation. Connectivity and Mobility have become commonplace and commodities globally. The Voice ARPUs have seen deadweight drops amidst serious hyper competition. In that context data is being referred to as the King as Data ARPUs start taking off in India. The Data surge is powered by increasingly large number of users who are beginning to use their mobile phones as more than just voice and SMS device. They are accessing the internet, applications and more services through their mobiles. Making the Moolah from Mobile Applications will involve changing the business models, shifting the perspective and defining value in a broader context for the mobile communication provider. The change driver in this domain is Internet’s personalization level for the user. The Internet led approach puts the user first and then allows the user to choose their own devices and the mode of interaction. Thus the game has shifted from customer empowerment to customer led personalization, whereby users can determine the level and context of their experience. Earlier the definition of a market used to be the service provider, the operator and the consumer. However, Mobile Apps and Telecom operators now need to create value by expanding the boundaries of their market to a much broader view of application driven commerce, content, delivery for the digital consumer. 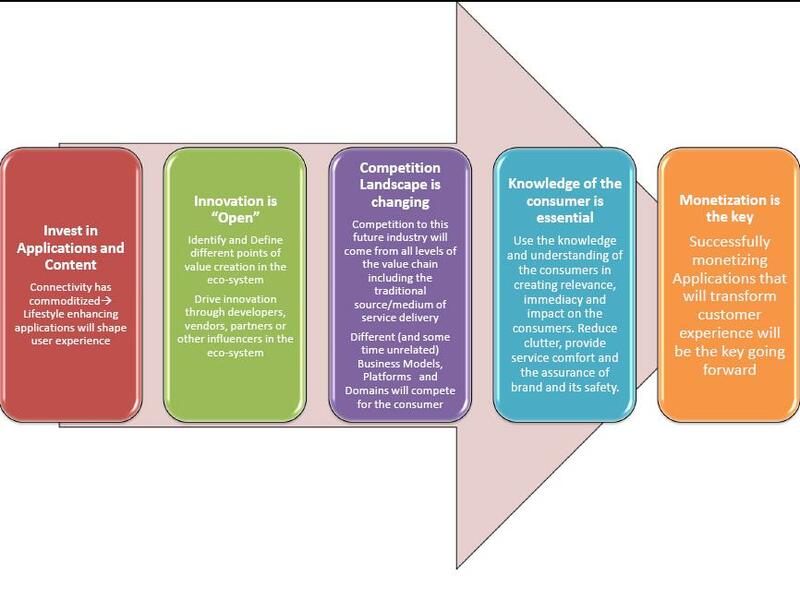 This may also include taking into account other influencers and stakeholders in the value chain for the consumer. Value thus would be created at all levels: Developer, Consumer segmentation approach, Internet Applications, Mobile Device companies, Operators and the final point of contact where “Consumer Need” is created. Mobile operators must render their platforms,infrastructure and networks capable of supporting a massive innovation network comprising of thousands of partners in the eco-system. The real power vested in the operators is the knowledge of their consumers, their habits, trends etc. It is not the data or voice pipeline to “faceless consumers”. The secret today is to identify consumer niches, derive insights and design/engineer services around these niches which are differentiated in terms of need appeasement. Application richness and relevance will rely on powerful personalization, based on customers’ past usage,purchase, browsing and mobile habits. Also the discovery, purchase and use of applications will have to be de-cluttered and simplified. The indicators in the picture above are roadmap constructs for building a future in Mobile Apps.Telcos will need to be mindful of these as tennets/ Strategy pillars for their mobile applications strategy. Telcos need to learn the art and science of “social merchandising”- Leveraging the power of social networks to act as a marketing “force multiplier”. By dynamically sharing browsing, recommendation and sharing history, social networking can evolve from an internet tool to a force that drives the adoption and use of entire new categories of applications and services. The capability to build a strong consumer centric strategy powered by Apps is not just a tactical move (much to what is likely to be believed by Telcos). It will involve a fundamental re-think of consumers, services, innovation and value networks and the role that the Telcos can play in value creation. Apps Store: Isnt as easy as getting one, like that! The Operator abilities to do the Apps stores will define their existence going into the future. However, it is not as easy as just creating a Apps Store. There are considerations that need to be factored in before any operator gets into a data and revenue based strategy around the Apps Store models. 1. Mobile operators can shore up their position in the mobile applications space by taking a series of definitive measures. Operators need to decide on the extent of activities that they would want to undertake in the application store segment. While global players with a large captive customer base might want to build end-to-end capabilities in the space, smaller players might decide to undertake only select activities in-house, relying extensively on third-parties for the technology platform. 2. A critical component of operator strategy to compete in the space would be their support of device-agnostic platforms. This will allow operators to support a much wider device portfolio through their storefront, while simultaneously reducing porting efforts, and hence costs and time-to-market for the developers. Additionally, platform-agnostic applications will allow a distinct positioning option for operators, thereby avoiding direct competition with vendor partners. Another option available to operators looking to encourage device-agnostic application creation would be to actively promote web-based applications. 3. Since the quality and reliability of the applications available on a storefront will be dependent on the strength of the developer community, it is imperative that operators provide the necessary incentives for the creation of exclusive applications for their storefronts. This will depend on aggressive revenue share arrangements, wherein operators allow developers to retain a higher share of the application revenues when compared to other storefronts, can help operators play the role of ‘disruptor’ and corner a higher market share. While a revenue share of at least 75% for the developers will be necessary to remain competitive, analysis indicates that by increasing developer share to 80%, operators can get incremental revenue uplift of around 11% points, resulting primarily from a greater market share of application downloads. 4. Operators should strive to develop pricing models which are optimized based on the nature of the application, with popularity, market potential and stickiness of an application being the defining criteria. For instance, typically applications in categories such as medical and finance are highly customized, resulting in a limited number of such applications. However, because of the utilitarian nature of these applications, the consumer willingness to pay is fairly high. As a result, these applications are very suitable for subscription pricing. Operators should also play an active role in formulating the monetization strategies of applications, to ensure the greatest returns from their storefronts. 5. Operators should launch application stores to retain their prominent position in mobile content distribution, as well as to benefit from new revenue streams through the sale of applications, provision of access services and rendering of additional services such as integrated billing and access to networks that application interfaces are supported on. While application stores provide operators with an opportunity to re-establish their position in the mobile content value chain, the opportunity requires a strong operational strategy for success. Operators need to leverage existing capabilities in this space so as to be able to create a robust offering for the consumers. The opportunity should be looked at from the perspective of a strategic imperative to reverse the present trend of disintermediation from the content ecosystem, rather than a pure revenue enhancement exercise. It can’t be left to Apple to pave the way anymore in the application store market. There is plenty of room for more. A recent Report by Capgemini has estimated the 2009 annual revenues from mobile app downloads to be $3.8 Billion. Given that the Apps eco-system is still developing and growing and Operators and handset manufacturers are trying to establish their own Apps stores and the increasing smartphone penetration, the Apps store revenues are likely to Reach US$ 8.6 billion by 2013, a CAGR of 30% between 2010 and 2013. Driven by the proliferation of free and mass market applications, the average selling price (ASP) for applications is likely to drop – analyst estimates indicate a value of US$ 1.72 by 2014, as compared to US$ 3.83 in 2009. Launching an application store will provide operators with an opportunity to augment their existing data services revenue. There are going to be primarily four revenue streams for operators, viz. revenue share from the sale of applications, mobile advertising revenue, incremental data usage revenue and payment gateway revenue. Relying on these revenue streams, our analysis indicates that a typical operator (based in Western Europe with a subscriber base of 50 million) can expect a data revenue uplift of 11% by 2013. Additionally, if an operator is successfully able to implement a strategy wherein they are able to push web-based applications which result in greater data consumption, the revenue upside can be as much as 17% with over 30%-40% of this uplift coming from increased data usage. In addition to augmenting current data revenues, applications storefronts can also be instrumental in attracting and retaining subscribers with high-spend on mobile data services. High-value customers exhibit a greater proclivity to download and use mobile applications. Moreover, application stores are becoming increasingly important for operators to build and maintain a robust content ecosystem, something that is essential in today’s economic climate and competitive landscape. Operators are threatened by the prospect of being rendered “bit-carriers” due to the expansion of online and device players across the value chain. The emergence of application stores as primary channels for mobile content distribution can further impact operators’ positioning in the value chain. Consequently, inaction in this space would not only undermine the competitive positioning of operators vis-à-vis other players who actively launch application Stores, but also the ability to drive data consumption amongst existing consumers. Indian Telecom Story (Part XXI): Over Capacity and Shake-out ahead! September 2009-The Indian telecom sector touched the 500 million subscriber base mark. Close on heels of that achievement, the DoT (Department of Telecom) reported on 12th December that average urban teledensity in India has now crossed the 100 per cent mark as per latest figures released by the department of telecom (DoT). Urban India accounts for close to 70 per cent of India’s 500 million cellular users and over 75 per cent of the telecom operators’ revenues. The larger implication is that the country’s beleaguered mobile operators, whose revenues and profits had dipped over the last two quarters due to the savage tariff war, will now have to increase their spending as they seek to sustain the current growth rates from rural India. Even as urban India enjoys telecom penetration along the lines of developed nations, the teledensity in rural areas is only at 18 per cent, DoT data reported. 100 per cent urban tele-density is not in terms of real customers, but it reflects multiple SIM ownership. If multiple SIMs were discarded, urban teledensity would be at 80 per cent, as per operators’ internal data. The DoT reported Himachal Pradesh to be enjoying the highest urban teledensity at 219 per cent, followed by Kerala at 156 per cent, Delhi (154 per cent), Chennai (143 per cent), Mumabi (125 per cent), Andhra Pradesh (121 per cent), Karnataka (116 per cent), while Rajasthan and Punjab have a little over 104 per cent each. Average urban penetration could go up 140 per cent within the next two years as over a fifth of residents in these zones were in the lower income bracket where mobile phones continued to remain an aspirational product. The DoT data also reveals that in nine states, the urban teledensity is less than the 100 per cent. For instance, Madhya Pradesh and Maharashtra has only about 76 per cent teledensity, the lowest for urban India, followed by North East and Assam (77 per cent). The intense price war in the telecom space over the past couple of months, which has plunged tariffs to an all time low and is eating into the operating margins of Telcos — of even half paise per second — has resulted in a record growth of 15 million plus customers signing up for mobile connections every month. The sector’s woes began when the government handed out new licenses to players in 2007, despite not having enough spectrum. The government wanted licence payments and competition, but it has created overcapacity, which will eventually lead to consolidation. Banks too have added fuel to the fire through indiscriminate lending. Banks and vendor financing is encouraging overcapacity in the sector, despite the fact that new players’ plans look unsustainable in the long-term.If that continues to be the case, there may be some bankruptcies in the sector within two years from now. The current scenario, with 10-11 players, is unsustainable and a reflection of poor government policies, an aberration which would correct itself. Analysts view that market with 5-6 players is ideal in the Indian context. It may be more logical to promote investments in telecom infrastructure, encourage rural penetration, get into data services and rural broadband rather than focus on market structure and price wars.